Performers include: Eddie McClintock, Joanne Kelly, Saul Rubinek, Genelle Williams, CCH Pounder, Simon Reynolds, and Allison Scagliotti. After saving the President’s life, two Secret Service agents are reassigned to Warehouse 13, a super-secret government storage area in South Dakota that holds supernatural objects, mysterious relics, and strange artifacts. Agent Peter Lattimer (Eddie McClintock) is a quick-thinker who’s both handsome and athletic. He also has a sixth sense when it comes to immediate dangers. His deaf sister has taught him how to read lips which can come in handy on the job. He’s not without his faults though as he’s a recovering alcoholic with a weakness for cookies. His partner is Agent Myka Bering (Joanne Kelly), a woman who, having grown up in her father’s bookstore, is book-smart with an eye for details. She sometimes takes her job too seriously and occassionally clashes with Lattimer. She naming her ferret “Pete,” because the pet and Lattimer can both be cute and annoying. In charge of Warehouse 13 is Agent Arthur “Artie” Nielsen (Saul Rubinek). Although much of his past remains a mystery, he was previously a cryptographer and was once convicted for treason for having sold secrets to the Soviets. He gets annoyed with those under him and charges them with tracking down new artifacts and helping him to keep the warehouse under control. Artie answers directly to Mrs. Irene Frederic (C.C.H. Pounder), the mysterious director of the secret organization. Claudia Donovan (Allison Scagliotti) is young and a whiz at technology. While searching for her brother, she hacked into the computer systems at the warehouse and kidnapped Artie to force him to help her. This led to a permanent position for Claudia at the warehouse. James MacPherson (Roger Rees) is former agent and partner of Artie’s at the Warehouse. This Brit is very knowledgeable about paranormal artifacts, is Artie’s arch-nemesis, and uses his talents for nefarous purposes. Leena (Genelle Williams) runs the bed-and-breakfast where Lattimer and Bering stay and can see people’s auras. She’s known about the warehouse for quite some time and knew several of the past agents who’d died protecting it. I think that the show should go on forever and is one of the best shows that I have seen in a long time.The is very interesting in many ways and has people that seem to care about what they are doing. I hope at some point Syfy will consider bringing this series back. It was always so funny, while being adventurous. Could never get enough of Eddie McClintock & Allison Scagliotti. I am sad to see that this series has come to end. I have been watching “Warehouse 13” from the beginning and I haven’t yet seen the last episode on my DVR. I love how something new and strange always goes on in the Warehouse and I will miss this show but all good things must come to an end and people move on. My best to the wonderful cast. Please keep Warehouse 13 on, I always look forward to them. It is a good show. Add more seasons of Warehouse 13 please. Characters are like beloved, likable, strange and wonderful family members. Also re-establish Eureka, another great show with awesome characters. Plenty of plot lines still available for both or even join the two together. drop one or more wrestling and/or fake ghost hunters. I bet many fans would pay a little extra on cable bill to keep both shows. 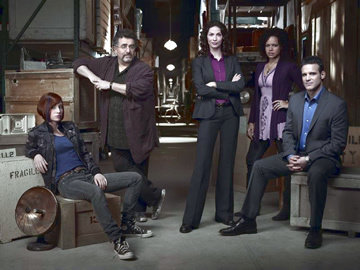 KEEP WAREHOUSE 13 ITS THE BEST SHOW PLEASE MAKE A PETITION TO KEEP THIS SHOW, ITS ONE OF THE ONLY REASON I WATCH SYFY. MAKE A PETITION TO SAVE WAREHOUSE 13!!!!!!!!! Why end the show when the characters are so well formed as well as the relationships. So many possible story plots and there is nothing else on like this HIT show. Please reconsider! I am addicted to this Warehouse 13 and have been since the first show. Would be such a waste when it still has so many possibilities.